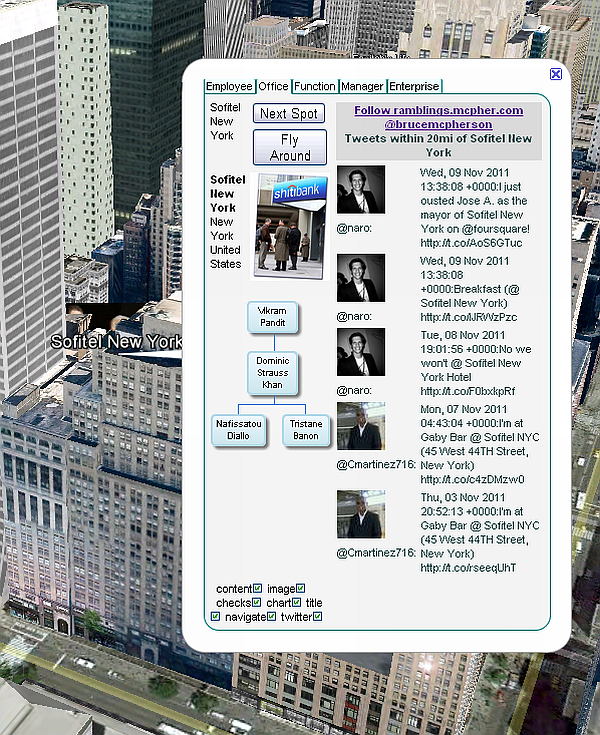 How to create rich applications which pulls together Google Maps ,Google Visualization, Twitter and Google Earth. Use the generated web applications as standalone web pages. Here are 4 ready made VizMap applications created by the example Excel Workbook. Or try a Google Earth Version. Or try the downloads page for more examples, or just download googlemapping.xlsm and generate them yourself. Here's a screenshot from an Earth version. You can select either just by changing a parameter in your worksheet. I haven't spent much time on populating these with accurate data but hopefully you can see the general approach from these web pages. You can read the Excel Ramblings Blog entry on this topic here. VizMap is the collection of components that allow you to create a data driven application that will merge google visualization and google mapping straight out of Excel. This consists of several components, which are all integrated in the Excel Driving application, and many of which can be seen in other roles throughout this site. 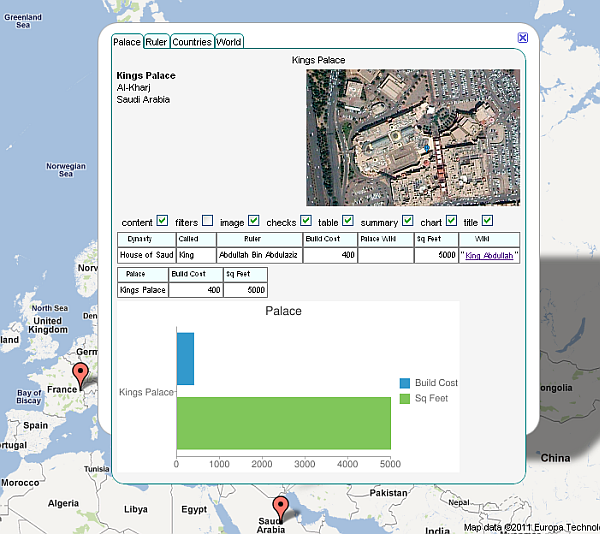 Here is a popped up info window from a VizMap application that simulates an organization with multiple sites. You can see that not only is there an org chart there are also selected tweets based on the location within some radius. Application specific parameters. These describe the data to be shown on the map, which visualizations to embed in the map Popup Windows, where to position them, what data to include, and any tailoring information required to construct specific web page look and content. There will be one of these for each VizMap application, and from this a self contained web application will be generated. Master/Transaction joining application. When creating these kind of applications, there is often a join of transactions to master data and look up data required. The googlemapping.xlsm workbook also contains a capability to do this using Data Manipulation Classes covered elsewhere on this site. Excel/Json Conversion. Data and parameters are communicated from Excel to the Web applications and web services used using jSon. We use the cJobject serialization capability covered elsewhere on this site. Here is how to setup your own VizMap application, and a deep dive into how it works.